Today, I was going to post on death rituals or mummification and reincarnation but as I was doing research, I got interested in learning about caste systems in India and ancient Egypt. I always feel a tad tenuous speaking as an authority on subjects, I have only read about…I dip my toes gingerly into the pool of history and beliefs of cultures not my own. I would be most happy if any readers from India and or Egypt would step in and make corrections or comments. I can only say I have the deepest respect for both these cultures and the accomplishments and ideas they have given to the world both then and now. Please know that any mistakes I make are not malicious but because I lack the knowledge. 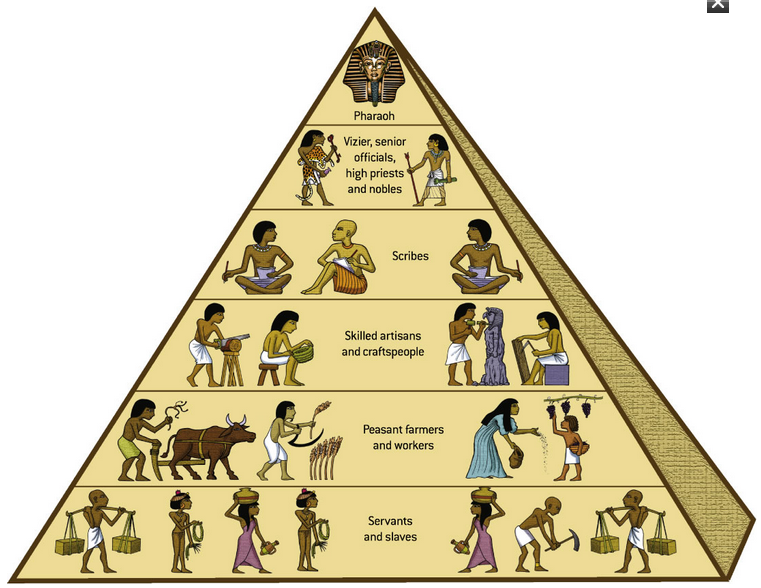 First a caste system is defined as a way to organize society into groups based on heredity. For Americans, we can understand this by the English system. It was ordered on a system of marriage only from the same group and heredity as a transmission for occupation, though education has become more important since the industrial revolution. And of course, Prince William married Kate Middleton, a commoner, and she will one day be Queen of England. They met and graduated from St. Andrews College in Scotland. This is quite similar to the caste system in India. And before we American deny a caste system here. . . . . have you noticed that most politicians come from a few select ivy league collages? Since the ancient Egyptian system is no longer in use, unless my Egyptian friends can elaborate, I will just talk about the Indian system. The charts are pretty self-explanatory so I have only a few comments to make. It is interesting to see similarities in the two charts of systems that started so long ago. In India, there used to just be the top four classes, until Mr. Gandhi , the father of modern and free India, made a lower caste called the untouchables, Dalits or the “children of God.” The Indian constitution has outlawed the caste system and has instituted “affirmative action” programs to help these people with the challenges in their lives. I think of the programs for hearing, speech , and sight impaired Indian people I blogged on earlier. Both of these are private organizations, though I am sure that the government has programs as well. Today in India, there is a different approach to the caste system in the cities than in the villages. In the cities with the rising middle class consisting of 50-75 million people, the emphasis has shifted more to education leading to work and marriage as the division. But in the villages, the caste system still usually dictates marriage rituals, births, deaths and occupation for all who lived there. Habits passed down from generation to generation are difficult to give up especially if you are a member of a higher caste. This is a reblog from a 2014 blog entitled The Caste System where you can read the 89 comments on this very provocative topic. Yesterday’s topic caste and quotas in India today made me think of reblogging this former post as clarification. Please share your comments and thoughts. This entry was posted in India, KFC, Religions of the World, Travel, Uncategorized and tagged Castes organization for work, Egypt, faith systems, Hinduism, India, people organizations, Religions of the World, The Caste System. Bookmark the permalink. you are entitled to your views. It is a Democracy after all. Yes, yes that is true. I have a great affection for India and Indians and always want to be respectful. I am forever grateful for amazing India I was blessed to spend 8 months and the kind generous welcome given to me by incredible Indians! Good and Bad exist all over the world. We have to extract the Good and leave the Bad behind. Well said! I agree completely. Thank you! It’s sad to see but caste system shows heavy presence in cities too. For the middle class family(in terms of financial status) all the old and bad rituals exist even in modern India. It is a hard tradition to release. How long do you think it will take to end this? Do you think that education or lack there of divides people more today or not? I think that is true in the United States. Thanks for your time and explanation. I hope for the best for India and Indian people. How old is India? Maybe in about that same amount of time things might change. However, with the advent of IT jobs, city life and intermarriage, things might change more quickly. Great question, Beth. the Indian culture dates back to 3300 BC one of the earliest on the earth in the Indus River Valley which is in Pakistan since the partition into two countries. India became declared an independent state on January 26, 1947 and became the Republic of India on January 26, 1950. So you are right. . . . . old traditions are very hard to leave behind. Thank you ! I am sure you are right as you are from India. I remember taking the students to the hospital up the street when they would eat street food and get Delhi Belly. We just wanted to sit and wait our turn, but it was insisted that we wait in a separate room and then hurriedly seen by the doctor. I tried to say NO , that we would wait our turn but to no avail. I didn’t like that at all , but really had no control. I think they were treating me with respect but I worried about the sicker Indian people some sitting on the floor! This is reality, we face it and forget it if it’s in our favour. I must appreciate you a lot that despite of being treated superior you felt bad. In India, power speaks more than humanity. The richer you are the quicker your problem will get solved. The “rich” here doesn’t mean only money-wise, caste wise, nationality wise etc. We don’t treat people equal. No one. We see people through the standard of work they do to earn their bread. Many work is Chota(small or below standard) here and the people who do that are Chota too. I am not only complaining about my country. There are many things to be proud of about my country. Here I am just telling you the reality. The things about my place which I don’t like. And may be I would like to change in my own subtle way now and in a big way someday if God permits. Thank you so much for your comment and sharing your dream for India. There are good and evil people everywhere. People with power find that hard to relinquish . But I am confident that maybe it will move slowly , but things will change in Incredible India for the better for all with citizens like you working for all! I have looked at many descriptions of the cast system in the past and read book after book. Thanks for addressing the topic visually. We can be sure that part of the system is based on color, and the rest is based on property ownership. It is not called caste in any other country, but the judgments are the same. Glad the poster helped in the understanding of caste. And you are right , it seems to me that there are caste systems all over the world even today, but maybe not as clearly nor with such guidelines. Mostly today it is division by money, jobs, education. What do you think? For me,I have to remember that we are all created in the image of God.